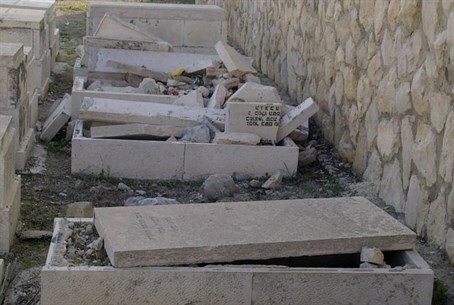 Following the severe vandalism on the ancient Mount of Olives Jewish cemetery by Arab rioters, the Religious Services Ministry intends to double the security budget for the site, Arutz Sheva has learned Tuesday. "We are not going to give in to terrorism in the Mount of Olives area," Religious Affairs Minister David Azoulay (Shas) stated Tuesday. "We will double the security budget during the approvals process for the state budget in order to stop vandalism on the Mount." "There are 5,000 vacant gravesites [on Mount of Olives], which you don't have on Har Hamenuchot [the other main cemetery in Jerusalem - ed. ], for example, but people are afraid to bury their loved ones there because of the desecration of gravestones and sense of a lack of security on the roads leading there," he added. Religious Affairs Ministry CEO Oded Fluss added that the entire issue speaks volumes about whether Israel is truly exercising its sovereignty over Jerusalem. He added that even a small boost in funding for security would solve many of the problems with the Mount. "I do not know why the desecration of graves at other locations stirs up a media storm, while here, it's done systematically," he lamented. a "We intend to make every effort to combat this phenomenon and bring this intolerable situation on the Mount of Olives and its roads to the public consciousness." The budget for Mount of Olives is due to be expanded in any event, as part of the implementation of the coalition agreement ruling party Likud signed with Shas to form the new government. Ongoing vandalism at the Mount has recently escalated, as Arabs have begun not only smashing tombstones, but torching graves as well. Jews are becoming afraid to bury their dead there as a result of the vandalism, which in some cases the Israel Police have blamed on the Jews themselves, in what activists say is an attempt to avoid tackling the problem.